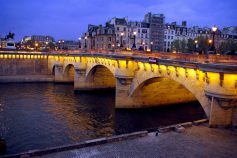 Despite its name the Pont-Neuf (literally New Bridge) is Paris’ oldest standing bridge. Spanning the Seine between the Right and Left Banks, it crosses the western tip of the Île de la Cité. Pont-Neuf is a stone bridge built in different stages between 1578 and 1607. The construction of a new bridge was decided in 1577 by king Henri III who laid the first stone on the 31st May 1578 in the presence of Mother Queen Catherine of Medicis and the Queen Louise of Lorraine. The construction ended in 1607 during the reign of Henri IV. The delay was due to the rebellion of the people of Paris against the king (1588-1598). In 1599, king Henry IV resumed the work and commissioned its completion to Guillaume Marchant and François Petit who modified the initial plan. Instead of supporting houses like any other bridges in Paris, the new bridge was the first to be ‘houses-free’. 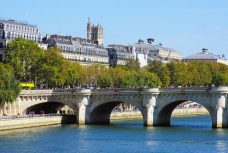 As the construction of the bridge touched to an end in 1606, the king decided to open a square between the Palais de la Cité and the western point where the bridge crosses the Île de la Cité. 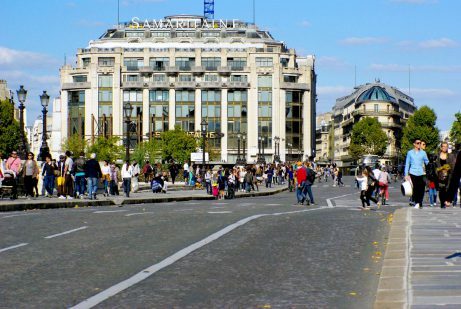 Today the royal square – one of the first in Paris with Place des Vosges in the Marais is called Place Dauphine. At completion, the Pont-Neuf was the only bridge to span the whole width of River Seine. It was the only bridge and the first causeway to feature pavements, thus protection pedestrians from horses and mud. Alcoves in half-moon shapes were built on top of each pile where merchants and craftsmen could trade. The number of booksellers who held the first public readings accompanied by musical entertainment and open-air shows increased. They used wheelbarrows to transport their books and sold them from trays fastened to the parapets of the bridges with thin leather straps. There are the ‘ancestors’ of today’s bouquinistes of Paris. Some 381 sculptures of mascarons by Germain Pilon decorate the each stone brackets of the bridge. The bridge was listed as a Monument Historique by the French State in 1889. 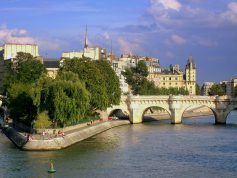 In 1991 the Pont-Neuf is part of the banks of River Seine that have been listed as a World Heritage site by Unesco. 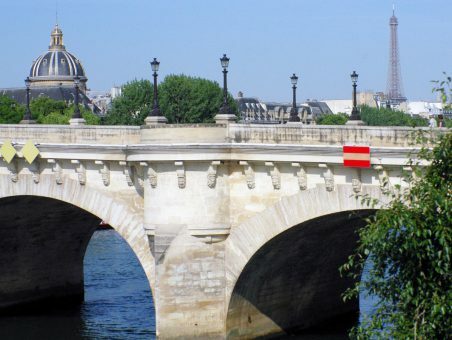 In 2007 the bridge was completely restored by the City of Paris. The bridge is 238 long and its width 20.50 m (including a causeway of 11.50m and two pavements of 4.50m each). The bridge has two separate spans: the span leaving the Right Bank has seven arches and that from the Left Bank has five arches. 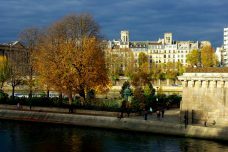 Previous ArticleTrivia about France: do you know the answers? Next Article Paris-Plages 2015 is getting ready!